The Istanbul organization Turancı Hareket Platformu (Platform for the Pan-Turk movement) calls on citizens of Turkey and other Turkic states to come out in support of the Crimean Tatar people. A video message with such a call from the Head of the platform Caner Öztürk was published on the organization’s Facebook page. Recalling that every day the life of the indigenous population of Crimea - the Crimean Tatars - is deteriorating due to the occupation by the ideological follower of Stalin - Vladimir Putin, Öztürk stressed that members of the Turkish organization are monitoring the developments in the occupied peninsula. Including the last detentions of the Crimean Tatars for holding single pickets. The head of the platform called on the Turkic world to go out to single pickets as well in order to support the Crimean Tatar people. “On October 20, we urge the entire Turkic world to demonstrate its attitude to the atrocities in the occupied Crimea, to demand the freedom to the illegally arrested Ilmi Umerov and Akhtem Chyigoz. We invite you to come out on single pickets to the squares with the same posters they had in the Crimea," Öztürk said in a video message. Previously, on October 14 in Crimea, a minimum of 34 people were detained for taking part in single pickets. 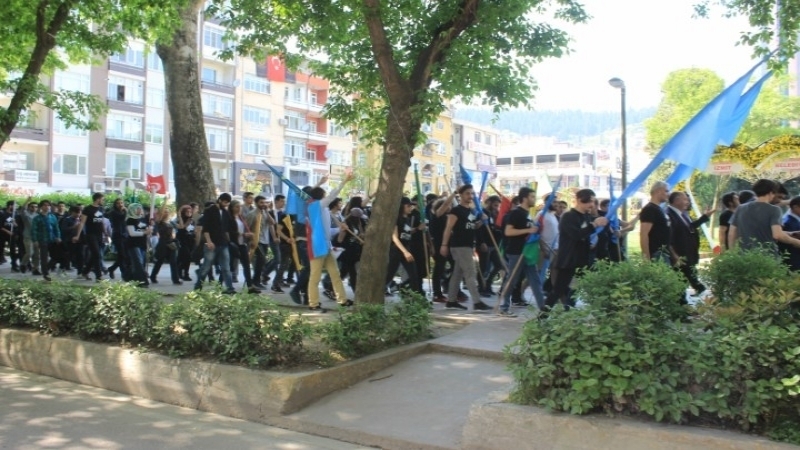 More than 100 people participated in the protests in the occupied peninsula. All the arrests were carried out with violation of even the current Russian legislation. Police was massively detaining activists who went on single pickets, protesting against the arbitrariness of Russian security forces against the Crimean Tatars. People came out with pickets throughout the Crimea. Pickets were held in Simferopol, Dzhankoy, Gvardeysk, Belogorsk and other cities of the occupied peninsula. On October 11, occupants were massively conducting searches and detentions in the homes of Crimean Tatars in Bakhchysarai from the early morning. Later, the Kremlin-controlled Simferopol court has chosen a measure of restraint for all six Crimean Tatars, who were searched on October 11. The activists were arrested for two months. The lawyer of one of the detainees said that the arrests of the Crimean Tatars were caused by the fact that the latter refused to recognize the new order in the Crimea and the annexation of the peninsula by Russia.